The New York Times Book Review called The Beastly Beatitudes of Balthazar B, J. P. Donleavy's hilarious, bittersweet tale of a lost young man's existential odyssey, "a triumphant piece of writing, achieved with that total authority, total mastery which shows that a fine writer is fully extended...." In the years before and after World War II, Balthazar B is the world's last shy, elegant young man. Born to riches in Paris and raised by his governess, Balthazar is shipped off to a British boarding school, where he meets the noble but naughty Beefy. The duo matriculate to Trinity College, Dublin, where Balthazar reads zoology and Beefy prepares for holy orders, all the while sharing amorous adventures high and low, until their university careers come to an abrupt and decidedly unholy end. 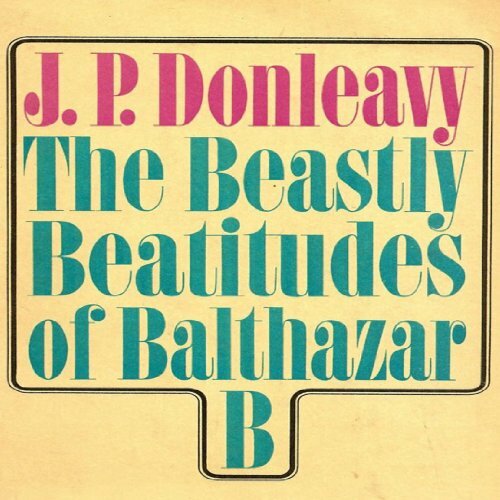 Written with trademark bravado and a healthy dose of sincerity, The Beastly Beatitudes of Balthazar B is vintage Donleavy. ©1968 J. P. Donleavy (P)2013 Audible, Inc. This is a marvelous audio production of Donleavy's finest mature novel. The narrator is a master of the array of accents required to do justice to the narrative. I re-read the book a number of times when it first came out. I'm planning to listen again.